I was recently looking for a new potato soup recipe. Now, I already have a very much-loved, coveted crock pot potato soup recipe. But I wanted something a little different. So I set out to find a new, delicious potato soup recipe. 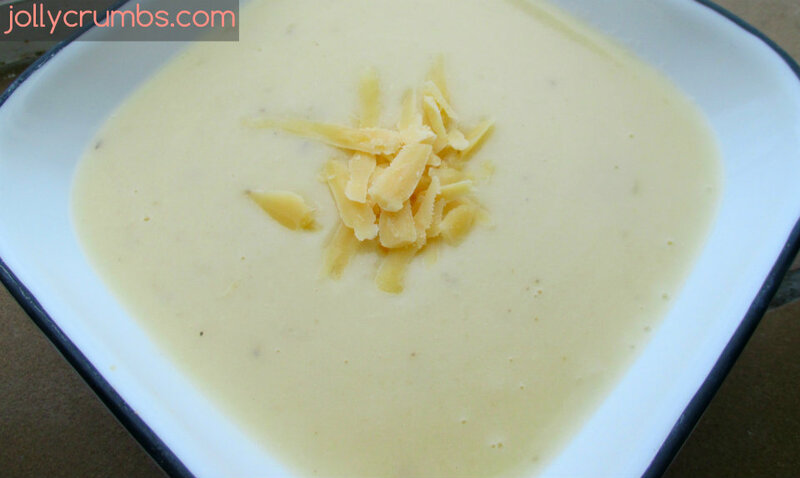 This potato soup recipe combines delicious roasted garlic, potatoes, Parmesan cheese, and cream. I know these may sound like calorie-rich ingredients, but I promise you this soup isn’t high in calories. It is so flavorful, creamy, and still in the realm of being healthy. So if you need a delicious potato soup recipe, or if you are in the market for a different one to try like I was, I can’t tell you enough how delicious this one is. 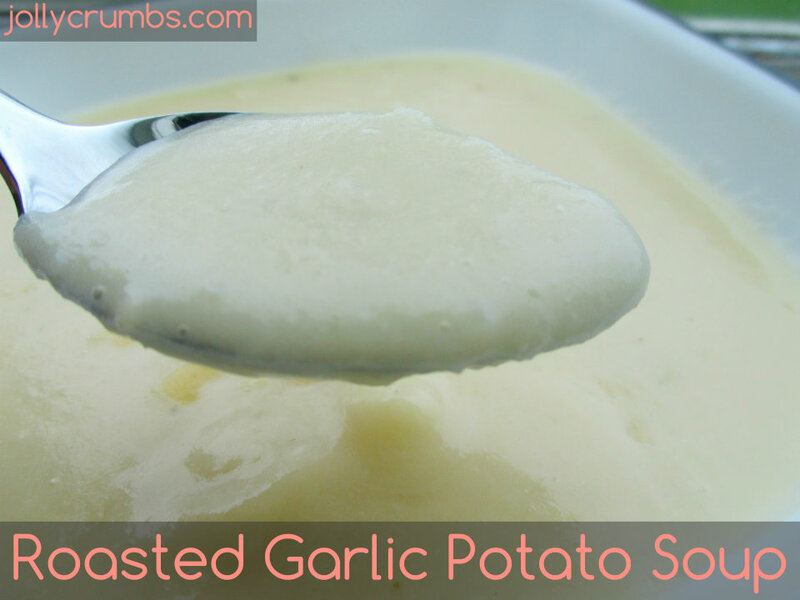 You really need to try this if you are a fan of potatoes, garlic, or Parmesan cheese. Preheat oven to 375°F. Slice off the top of the head of garlic to expose most of the cloves and peel of as many outer layers of the garlic as possible. Drizzle with olive oil and sprinkle lightly with salt and pepper. Wrap the garlic in a piece of aluminum foil, place the foil on a baking sheet or in a muffin tin, and roast in the oven for 40 to 45 minutes until the garlic is fragrant and soft. Let cool before squeezing cloves from the garlic head. Melt the margarine in a large pot over medium heat. 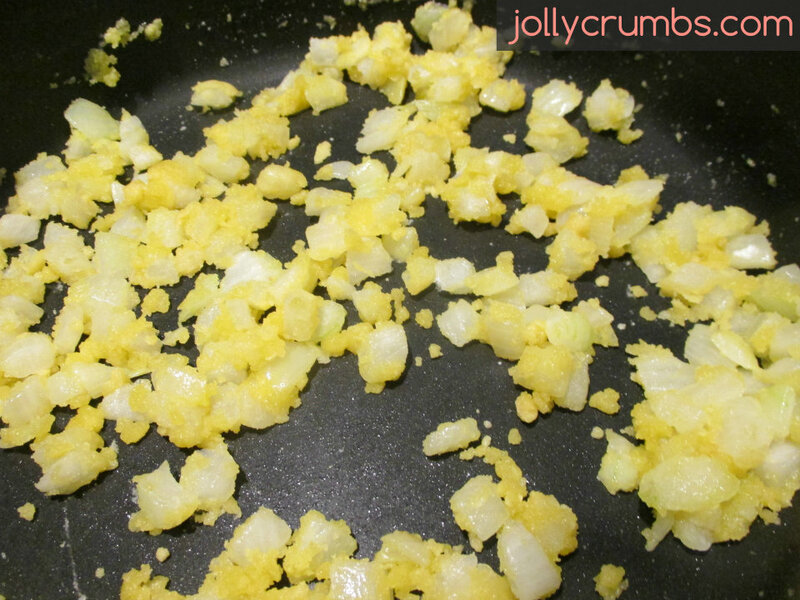 Add the onions and allow to cook for 3 to 4 minutes until translucent. Add the flour and let cook for 1 additional minute, stir and do not let the flour brown. 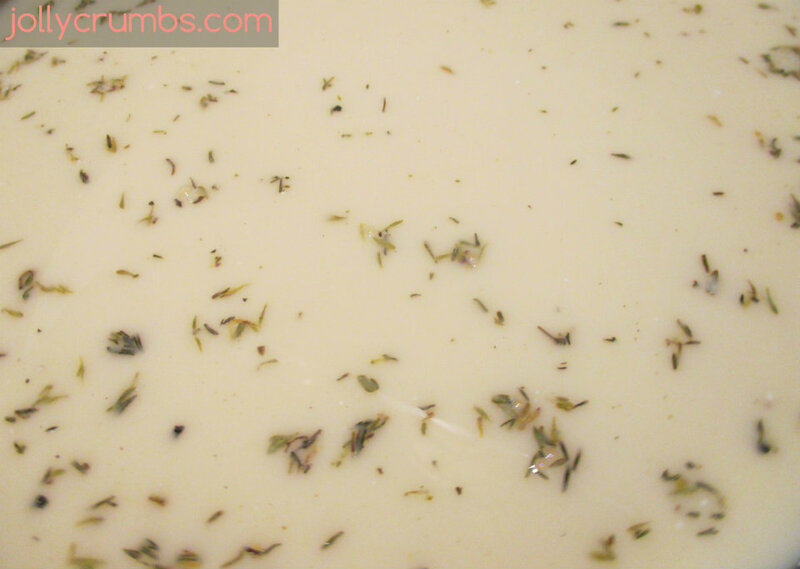 Add the vegetable broth, milk, cream, thyme, salt and pepper. Let the soup come to a boil, then allow to simmer for 2 to 3 minutes, whisking a few times in between. Add the potatoes, roasted garlic cloves, and parmesan cheese. Using an immersion blender or regular blender, blend until smooth. Serve warm topped with additional parmesan cheese, crackers, or sliced scallions. This is one of the best soups I have made yet. It is incredibly smooth, creamy, and flavorful. I love potato soups, but this one is absolutely delicious. The roasted garlic adds a wonderful depth of flavor to this soup. 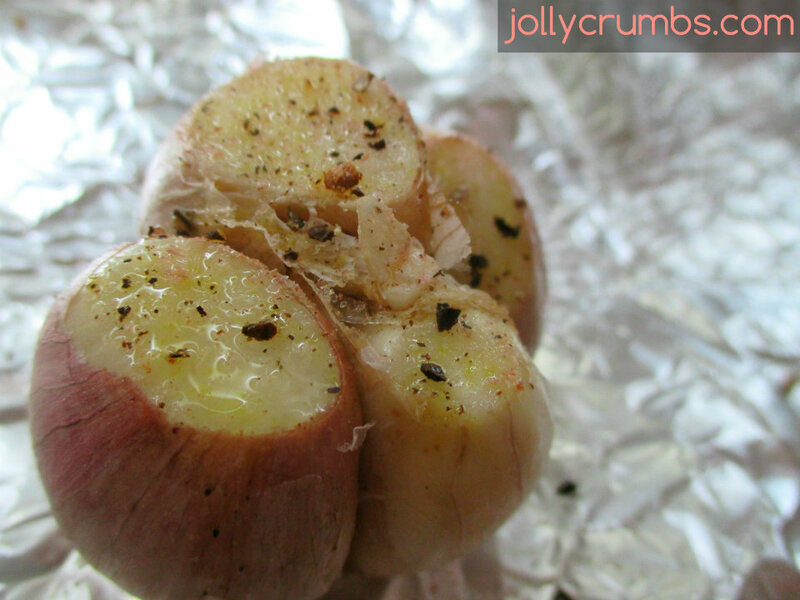 The garlic becomes slightly sweet and a little smokey once you roast it. The Parmesan cheese also adds a wonderful tang and creaminess to the soup. If you are looking for a new potato soup to try like I was, I highly recommend giving this one a try! Slice off the top of the head of garlic to expose most of the cloves and peel of as many outer layers of the garlic as possible. Drizzle with olive oil and sprinkle lightly with salt and pepper. Wrap the garlic in a piece of aluminum foil, place the foil on a baking sheet or in a muffin tin, and roast in the oven for 40 to 45 minutes until the garlic is fragrant and soft. Let cool before squeezing cloves from the garlic head. Add the vegetable broth, milk, cream, thyme, salt and pepper. Let the soup come to a boil, then allow to simmer for 2 to 3 minutes, whisking a few times in between. Add the potatoes, roasted garlic cloves, and parmesan cheese. Using an immersion blender or regular blender, blend until smooth. Serve warm topped with additional parmesan cheese, crackers, or sliced scallions.